The User Rights Editor allows you to define the User Rights of anyone that uses Fernhill SCADA on Windows. You can grant rights to individual users, or user groups. Click on User Rights Editor. To browse for user or group names click Advanced. 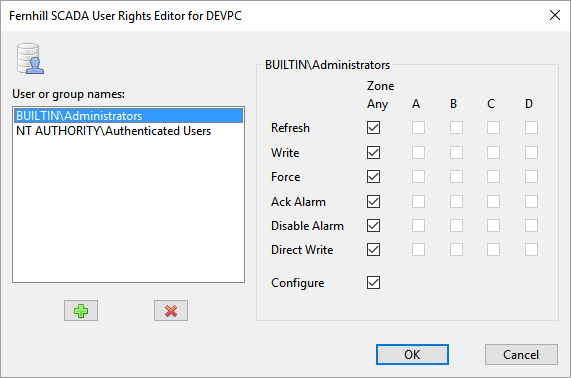 You can add any number of user or group names to the User Rights Editor. In the User or group names list, select the name of the user or group you want to change. To grant a right, select the corresponding check box. To deny a right, clear the corresponding check box. 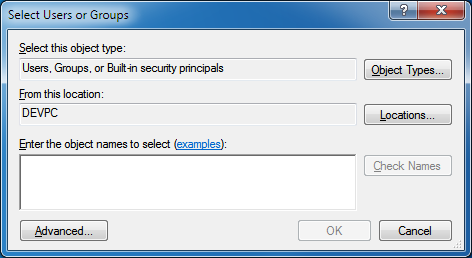 To remove a user or group, first select the name of the user or group in the User or group names list. To learn how to edit user rights on Linux computers. To learn about the different User Rights in Fernhill SCADA. To learn about the tools in Fernhill SCADA.